Jamaica is an island country in the Caribbean; it is part of the Greater Antilles. The island, 10,990 square kilometres (4,240 sq mi) in area, lies about 145 kilometres (90 mi) south of Cuba, and 191 kilometres (119 mi) west of Hispaniola. Its capital is Kingston; other towns include Montego Bay, St. Ann's Bay and Spanish Town. The island is divided into three counties – Cornwall, Middlesex and Surrey – which are subdivided into 14 parishes: Kingston, St. Andrew, St. Catherine, Clarendon,Manchester, St. Elizabeth, Westmoreland, Hanover, St. James, Trelawny, St. Ann, St. Mary, Portland and St. Thomas. Jamaica is the third-largest island country in the Greater Antilles. Its Taíno name was Xaymaca, meaning "Land of Springs". Jamaica is part of the West Indies. Tarch 2016. Prime Minister Holness acts as head of government of Jamaica. Jamaica has traditionally had a system of two parties, with power often alternating between the People's National Party and Jamaica Labour Party (JLP). 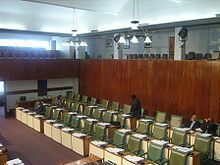 The party with current administrative and legislative power is Jamaica Labour Party, with a two-thirds Parliamentary majority as of 2016. According to estimates about 70% of Jamaicans are Black and the rest of the 30% are composed of mostly Mixed Race people, but also includes White and Asian Jamaicans. The Blue Mountains are the longest mountain range in Jamaica. They include the island's highest point, Blue Mountain Peak, at 2,256 metres (7,402 ft). The island is known for the Rastafarian movement, as well as reggae artist Bob Marley. The popular sprinter Usain Bolt is also an asset from the country. Usain Bolt won gold in the 100 and 200 races in Rio 2016. 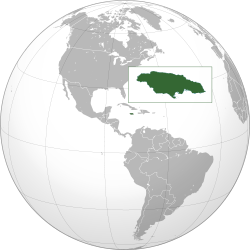 ↑ The CIA World Factbook – Jamaica. Retrieved 16 September 2015. ↑ "The World Factbook — Central Intelligence Agency". Cia.gov. Retrieved 25 September 2017. ↑ 4.0 4.1 4.2 4.3 "Jamaica". International Monetary Fund. 2016. Retrieved 1 April 2016. ↑ "Country Comparison: Distribution 0f Family Income – Gini Index". World Factbook. CIA. Retrieved 8 February 2016. ↑ "2015 Human Development Report" (PDF). United Nations Development Programme. 2014. Retrieved 15 December 2015. ↑ "Taíno Dictionary" (in Spanish). The United Confederation of Taíno People. Archived from the original on 16 October 2007. Retrieved 18 October 2007. ↑ 9.0 9.1 Glenn Woodley (1 April 2001). "The Taino of Jamaica (Jamaica)". Jamaicans.com. Retrieved 15 April 2013. ↑ "Jamaica". www.worldstatesmen.org. Retrieved 11 January 2019. ↑ "Jamaica". Ethnologue. 2013. Retrieved 15 April 2013. ↑ 24.0 24.1 "Jamaica National Heritage Trust – Black River". Archived from the original on 7 March 2009.